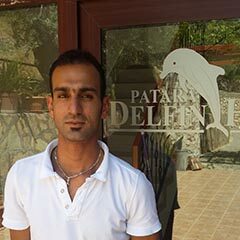 Ali has been working at Delfin Hotel for 3 years now. He is the one prepares all the breakfast and lunch at the hotel. You might see him serving drinks at the pool bar too. Betul is our new hard-working house keeper. She have started working with us this year but she already proved that she is meticulous about cleaning. In the morning she is helping breakfast service for sometime and then take care of rooms until the tea and cake time at 5. She has 2 children. She is joined the family in June 2014 by marrying Tunahan. So it will be her first proper season working at the hotel. She is making the cakes for the tea time and helping breakfast. She sometimes will be at the pool bar to serve drinks. She is trying to impove her english at the moment. He is youngest son of the family. He has recently graduated from University, he studied tourism business management. He is actually works in our restaurant. 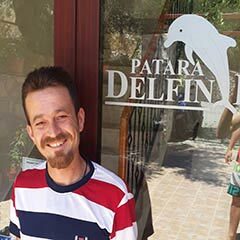 Besides restaurant he is taking care of our pool bar and stays at staff room near reception to be around at nights if anything is needed. He is father of the family. Everyone in the village call him Nicholas. He is retired now and left the business to his sons. He loves to take care of the garden. He often introduce himself as gardener. He has an extended driving licience which is needed to carry passengers. He is also do our tours and trips. This is me who made the website here. I am at the reception most of the time. I have studied Architecture in Ankara. I work as an architect in winters, usually on social projects. I do almost all the office work. 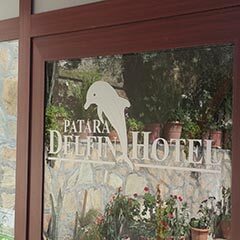 I design marketing materiels and websites for the hotel. I try to arrange any requests of our guests.